WHAT IS LASER VISION CORRECTION? Eyes can be aggravated by such environmental conditions as warm air blasting from the vents in cars, offices and homes, bitterly cold winds whipping at our faces and even wet, moldy spaces. Whether it’s dry eye, allergies or other aggravating eye conditions, your eye care provider can provide relief. What is Dry Eye? Dry Eye is a cornea disease that results from the eye’s reduced ability to produce tears or produce poor quality tears. Aqueous tear-deficient dry eye is a disorder in which the lacrimal glands fail to produce enough of the watery component of tears to maintain a healthy eye surface. Inflammation of the meibomian glands. These glands make the lipid part of tears that slows evaporation and keeps the tears stable. In addition, inflammation of the surface of the eye may occur along with dry eye. If left untreated, this condition can lead to pain, ulcers, or scars on the cornea, and some loss of vision. Irritation from dry eye comes from a lack of lubrication, which exposes the nerves on the cornea. Therefore, any change in temperature, humidity or elevation can increase symptoms of redness, burning, itching and irritation. If dry eye is making you miserable and or have vision problems, then make an appointment with your eye doctor for a comprehensive eye exam to find out more about what is causing your dry eye. There may be a treatment that can provide the relief you have been seeking. Griffin Eye Center, Neil B. Griffin, M.D., specializes in cataract, LASIK and Corneal surgery. 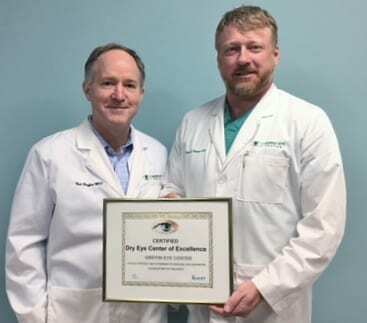 He is board certified by American Board of Ophthalmology and fellowship trained in cornea and external eye diseases and his center has been recognized as a Dry Eye Center of Excellence. If you’re one of the nearly five million Americans with dry eyes and would like more information on dry eye visit www.griffineyecenter.com or schedule an appointment at 843-449-6414. © Copyright 2019 Griffin Eye Center. All Rights Reserved.